To say this is an understatement would be . . . well . . . an even bigger understatement. In order to understand the stories of these women, their husbands, families, and the society that wraps itself around them, one can’t tell the players without a scorecard. And fortunately for the reader, Ms. Frieda provides that scorecard in the form of genealogical charts of each of the major families. The Houses of Medici, Sforza, della Rovere, Gonzaga, Este, Borgia, and Aragona (Naples) are clearly outlined with names, dates of birth, marriages, and deaths, that explain the multiple (and often conspiratorial) relationships. Delineations of power in houses are clearly explained throughout the book, and as these powers ebb and flow through wartime, peace, and religious events, the second scorecard comes into play: that of the map of the Italian boot. Ms. Frieda’s descriptions of the women and time in which they lived are rich in visual detail—societal, familial, and pastoral. This was a time that required that they be strong mentally, physically, and cunningly, and Ms. Frieda has clearly captured these strengths as she walks us through each individual ‘s trials and tribulations. The women discussed in such detail are Lucrezia Turnabuoni, Clarice Orsini, Beatrice d’Este, Isabella d’Este, Giulia Farnese, Isabella d’Aragona, Caterina Sforza, and Lucrezia Borgia. 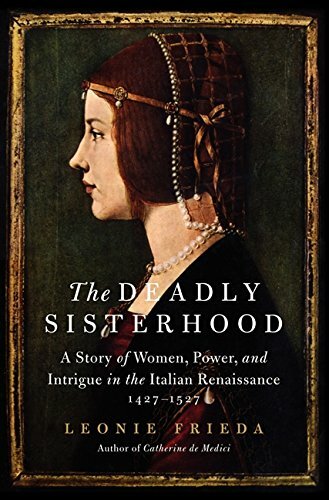 The discussion in The Deadly Sisterhood: A Story of Women, Power, and Intrigue in the Italian Renaissance, 1427–1527 takes us beyond just the births, lives, and deaths of these women. We experience the intrigues they incite and those they experience; the jealousy among these women as they attempt to outdo their peers, who are often also their relatives, and the grief they experience through the losses of children, husbands, parents, and lovers. We get to meet the men who thought they ruled the women . . . but little did they know that female intrigue often worked behind the scenes to ensure that these very same men were bolstered by the women they were married to and/or had affairs with. It should be noted that in many of the descriptions offered by Ms. Frieda regarding these men, there is a certain disdain that creeps into the discussions such as when she describes Joffre, the illegitimate son of Rodrigo Borgia (Pope Alexander VI) as a “superficial . . . nincompoop.” One can only smile and turn the page, hoping for more insight into the men of the Italian Renaissance. In bringing these men to life, Ms. Frieda shares their weaknesses with us, and educates us to how the women may well have played upon those weaknesses for their own benefit. But while the relationships are also often fraught with jealousy, disrespect, intrigue, and avarice, there is also a poignancy to some of these relationships that Ms. Frieda handles with care. The Catholic Church is not without its appearance in The Deadly Sisterhood, and the reader is given a deeper insight into the religious threads that wrapped around these women and the fights and sacrifices they experienced to achieve what independence they could. Considering the depth of detail surrounding the activities of these women, the book frequently requires stopping and going back to reread some piece of information or historical analysis by the author, but The Deadly Sisterhood is an interesting walk through this time and place in history—a good read.